A man reportedly acting erratically in a Logan Heights neighborhood Friday drove off when police arrived, leading a roughly 10-minute pursuit that ended with a crash that closed a heavily traveled freeway connector amid rush-hour traffic. Officers went to the 3200 block of Steel Street shortly before 4:30 p.m. to look into a report that someone was behaving strangely in the area, according to San Diego police. The patrol personnel found the subject of the call sitting in a parked car. As they tried to get a dialogue going with him, the man rolled up the driver’s side window and refused to come out, Officer Ben Newton said. A short time later, the man drove away, crashing into several parked vehicles in the process. The officers tailed him as he entered nearby state Route 15 and fled to the north, Newton said. Reaching State Route 94, the man tried to merge into the eastbound lanes but lost control of the car, which spun out and skidded to a halt on the ramp. He then surrendered without further incident, Newton said. 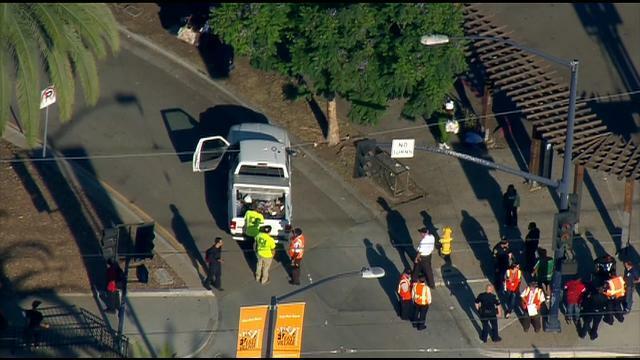 Authorities closed the connector while dealing with the suspect and his vehicle, according to the California Highway Patrol. His name was not immediately released.